WICHITA, Kansas, June 7, 2017 – From a Dyno Drag Racing Championship in genuine Ford Shelby GT-H Mustangs to exhibits of its latest vehicles including the all-new 2018 Mustang, Ford will thrill fans during the 8th Annual Blacktop Nationals at Riverfest in Wichita, Kansas, on June 2 – 10, 2017. 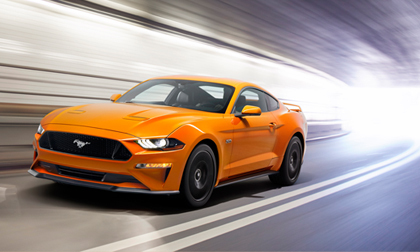 The corner of Douglas and Water Streets will become a hot bed of performance with an interactive display that gives enthusiasts the chance to get behind the wheel of a Shelby GT-H Mustang on a drag racing dyno to compete for prizes. Ford’s Dyno Drag Racing Championship will let enthusiasts experience the excitement of the V8 powered Shelby GT-H Mustang. Competitors will race inside one of the Hertz cars connected to a dyno at the event. The three fastest drivers who compete between June 2 and 9 will face-off in an ultimate battle for the championship title on Saturday, June 10, at 1:15 pm. The driver with the fastest time will take home an exclusive Ford prize package including a trophy and the title of 2017 Blacktop Nationals at Riverfest Ford Dyno Drag Racing Champion. Riverfest will also host a spirited local celebrity Dyno Drag Race Challenge at 4 p.m., on Thursday, June 8. Among the racers will be Olympic Light Flyweight Boxer Nico Hernandez, along with Admiral Windwagon Smith XLIV, Riverfest 2017 Ambassador Wendy Johnson and other local luminaries. One of the highlights of the Ford display will be the new 2018 Mustang. Held annually, Blacktop Nationals at Riverfest is one of the nation’s largest lifestyle shows. From performance displays and demonstrations for auto enthusiasts, to live entertainment for those who simply want to enjoy a few days in the sun, Blacktop Nationals at Riverfest has something the whole family can enjoy. For event information, visit the Riverfest website. Information on the weekend event can also be found on Facebook and Twitter – @blacktopnation.